Information technology is ever changing, and keeping up with emerging trends isn't always easy. 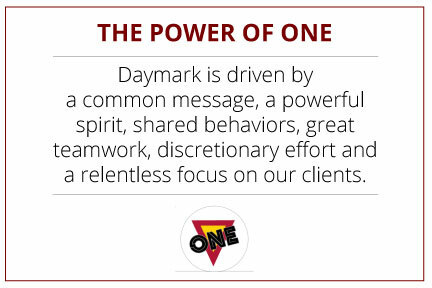 Solving problems for our clients is why we’re in business, and at Daymark, we love a good challenge. We love what we do and we like to have fun doing it - but we also know the value of hard work. We're always there for our clients – day or night. It's just who we are. We reply early and fast to inquiries. We pride ourselves on listening intently and being flexible. It’s why our customers trust us. We always deliver more than what's expected of us because we know that being good isn't good enough. To be the best, we need to do much more, which is why we continuously reward employees who go the extra mile for our clients. Our local roots extend well past the New England states. Many of our clients have large global operations. We support them by deploying complex infrastructures around the world and manage multi-vendor solutions across a wide range of industries in more than a dozen countries. Our eight-phase methodology - comprised of three stages, is critical to our clients’ success. 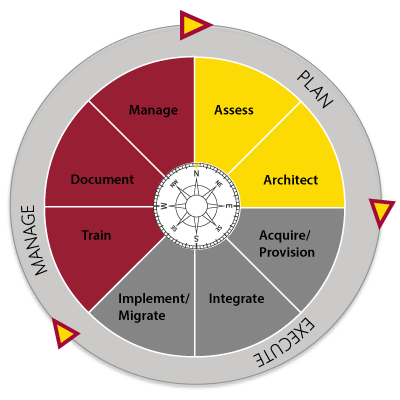 Assess: We begin by conducting a comprehensive assessment, to evaluate your current IT infrastructure. Architect: We use the findings from our assessments to architect a solution that fits your business' needs now, and scales with you as you grow. Acquire: We start the execution stage by determining the assets required for your customized solution –hardware, software, cloud components and professional services required to make them all work efficiently. Integrate: There is seldom a “blank slate.” We know that seamlessly integrating your existing infrastructure with your new IT architecture is critical. Daymark’s professional services team of experts will do the heavy lifting to ensure a smooth transition. Implement: Our on-site integration lab enables us to setup and configure your solution, test components, upgrade firmware and verify the accuracy and health of your hardware and software before it’s ever integrated into your live environment. Train: Our training mantra is “Give a man a fish and he’ll eat for a day. Teach a man to fish and he’ll eat for a lifetime.” We strive to have knowledge transfer take place throughout the entire implementation, starting in the Assess and Architect phases. Document: The documentation phase is one of the most important phases in our 8-phase methodology. Detailed documentation of the entire implementation, including configuration, helps ensure a smooth transition and makes for easy reference after you go-live. Manage: The manage phase ensures that support contracts are in place, serial numbers are documented and that you know who to contact if you have questions.